Don’t miss the annual Spring Show at Charles Beckendorf Gallery, 105 N. Adams Street, on Saturday May 18th from 10am to 5pm. 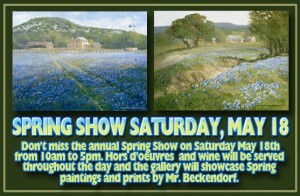 Hors d’oeuvres and wine will be served throughout the day and the gallery will showcase Spring paintings and prints by Mr. Beckendorf. The gallery is open daily – 10:00-5:00 and Sundays 1:00-5:00.